Hartford HealthCare Rehabilitation Network has had a successful year with many people to recognize as we get closer to our goal to help every patient get back to their everyday lives. This report is a snapshot of the progress we have made this year. 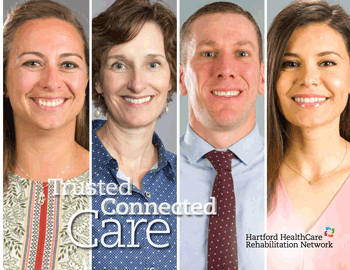 Growth and quality of care continue to be a focus for Hartford HealthCare Rehabilitation Network. Our values of Integrity, Caring, Excellence, and Safety are the foundation of our work as we collaborate with our rehabilitation partners across Hartford HealthCare’s continuum of care including: Hartford HealthCare at Home, Backus Hospital Rehabilitation Network, Hartford Hospital Rehabilitation Network, The Hospital of Central Connecticut Rehabilitation Network, Windham Hospital Rehabilitation Network, Jefferson House, Jerome Home and Southington Care Center. Hartford HealthCare Rehabilitation Network continues to grow, with five new clinics opening this year in towns across the state. This will allow us to bring care to our patient that is closer to home. We continue to improve the way that care is being delivered by collecting, measuring and reporting patient experience and functional outcomes. This is an important component to help our patients and customers see the value they are receiving from our care. This year, Hartford HealthCare Rehabilitation Network celebrated a milestone of 20 years in business. We started as Eastern Rehabilitation Network with just a few clinics, to what we have become today, the premier provider of rehabilitation services in the state with more than 75 locations in settings across the continuum.